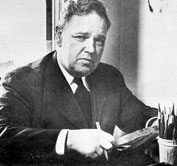 Whittaker Chambers recounts feelings that communism had crushed his will. To bring this reality to the forefront, over 100 Polish Americans gathered at the National Katyn Memorial in Baltimore, Md. 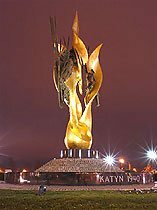 on April 24, 2005 to remember a massacre, in which 20,000 Polish military officers (mostly reservists) were brutally killed in and around Russia’s Katyn Forest in 1940. These included priests, doctors, professors, school teachers, lawyers, judges, civil servants and others. The National Katyn Memorial in Baltimore stands at the intersection of President and Aliceanna Streets. This year’s event was the fifth annual remembrance at the National Katyn Memorial in Baltimore. The day’s events began with a Mass at Holy Rosary Parish in downtown Baltimore. After coffee and doughnuts, attendees went to the nearby National Katyn Memorial at the intersection of President and Aliceanna Streets. The monument consists of a large gold-colored flame, a symbol of rebirth or transformation. Amid the flames stand statues of great personages from Poland’s history, including: Boleslaw Chrobry, the first crowned king of Poland and King Jan Sobieski, who led his winged hussars to defeat the Turks and lift the siege of Vienna. The impressive list of guest speakers included a representative from Gov. Robert Erlich’s office and U.S. Senator Paul S. Sarbanes (D). Fifteen young girls, dressed in beautiful traditional Polish dresses, added life to the event by dancing national folk dances. After the memorial at the monument, attendees were invited for a meal at the Polish National Alliance building a few blocks away. During the meal two aluminum plaques were unveiled: one explaining the Katyn Massacre and another describing the monument. These will be placed at the monument’s base to explain its significance to passersby. During the meal, members of the National Katyn Memorial Foundation spoke on the importance of remembering the Katyn Massacre and spreading awareness so that such a tragedy never occurs again. 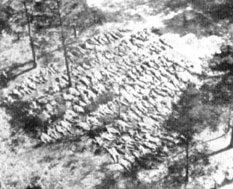 The bodies of 20,000 Polish officers were thrown into mass graves, in Russia’s Katyn Forest and nearby areas. To fully understand the significance of the Katyn Massacre, it helps to look back to the beginning of World War II. On September 1, 1939, Nazi Germany invaded Poland from the west, an event which sparked the outbreak of the war. A couple of weeks later, the Soviet Union, at that time allied with the Nazis, invaded from the east. Sandwiched by this Soviet-Nazi alliance, Poland fought valiantly before falling to the two invaders. The Soviet rulers terrorized Poland, sending 1.5 million citizens to Siberia, capturing 250,000 military personnel and sending over 20,000 border-guard officers to three Soviet prison camps. After months of interrogations and attempted indoctrination, they were put on trains under the false impression that they were being returned to Poland. From the trains, they were transferred to prison buses which drove them into remote areas of the Russian forest, where they were bound, shot in the back of the head and thrown into mass graves. In 1941, Nazi Germany turned against its Communist ally and invaded the Soviet Union. Subsequently, the Soviet Union attempted to blame the Katyn Massacre on the Germans. The Soviet Union only admitted guilt in 1989 after the fall of the Iron Curtain. 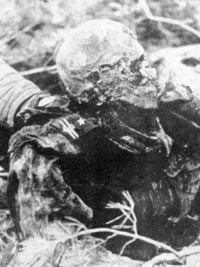 The body of a Polish officer pulled from a mass grave in Katyn. His point calls to mind a fact that after the fall of the Iron Curtain is not popular to vocalize. Communism is a parasitic evil that saps the life blood from the civilizations upon which it preys. The history of communism in Cambodia, Russia and China demonstrate the extent of this truth. Unfortunately, the world has never publicly acknowledged this evil. There was never a Nuremberg trial to call the perpetrators of Communism to task. Therefore, it is important that events like this memorial ceremony take place. When memorials are forgotten, history threatens to repeat itself. Is this happening today? Far from dying, Communism continues to live. A large part of the world still lives under its yoke and Russian President Vladimir Putin continues to lament the fall of the Soviet Empire. This is incomprehensible. Communism should not be lamented, but publicly repudiated as one of the greatest errors of modern history. Only then will its rebound be certainly averted. This is the true value of the Katyn Memorial in Baltimore. As the event’s organizers stated, by spreading awareness of these tragedies, the risk of their recurring is lessened. Therefore, the victims of Katyn must not be forgotten. Their remembrance strengthens the will to resist and neutralizes Communism’s desire to kill that will in individuals and nations. Whittaker Chambers, Witness (Regenery Gateway, Washington, D.C. 1980) p. 21.